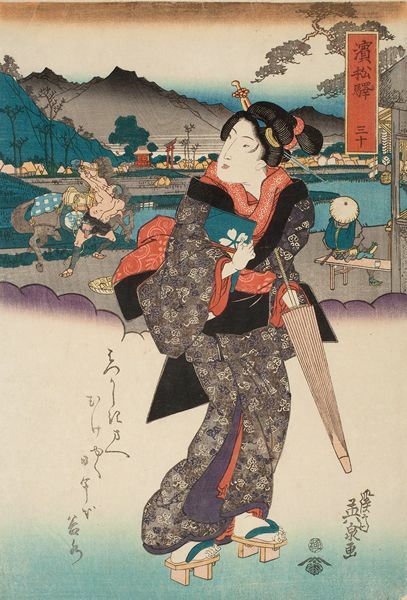 Kikugawa Eizan (1787-1867)- Woman with Umbrella. Circa 1820. Vertical oban diptych. 75.4 x 25cm. Fine impression, colour and condition. Tsukioka Yoshitoshi (1839-1892)- The Foxfires in Nijushiko (Nijushiko kitsunebi no zu). From the series Shingata sanjurokkaisen (New Forms of Thirty-six Ghosts). 1892. Oban. Keyes 509-30.Stevenson 30. Fine impression with two colour cartouche, metallic printing, wood-grain and blind-printing.. Fine colour. Backed, otherwise very good condition. Oban triptych. Fine impression, colour and condition. (Note the extensive use of the Genji mon throughout the print). Tsukioka Yoshitoshi (1839-1892)- The Spirit of the Komachi Cherry Tree (Komachi-zakura no sei). From the series Shingata sanjurokkaisen (New Forms of Thirty-Six Ghosts). 1889. Oban. Keyes 509-7, Stevenson 8. Fine impression with two colour cartouche. Fine colour and condition. 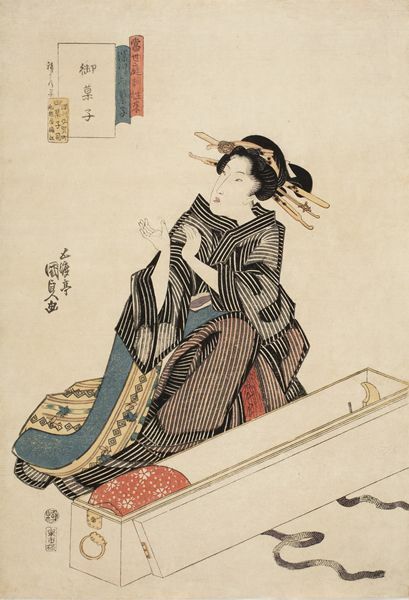 Tsukioka Yoshitoshi (1839-1892)- The Ghost of Okiku at Sarayashiki (Sarayashiki Okiku no rei). From the series Shingata sanjurokkaisen(New Forms of Thirty-six Ghosts). 1890. Oban. Keyes 509-17, Stevenson 17. Fine impression with two colour cartouche. Fine colour and condition. 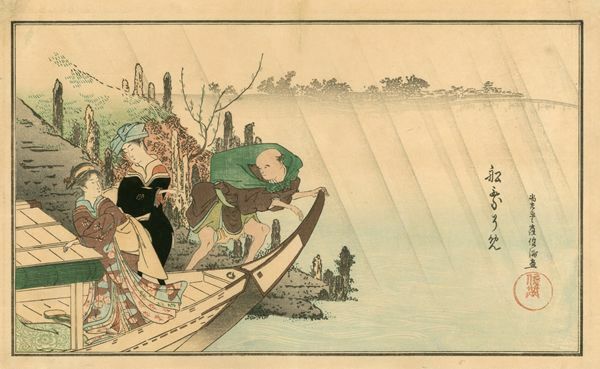 Kubo Shumman (1757-1820)- Two Women Boarding a Pleasure Boat. From the poetry album, Momo Saezuri (A Hundred Twitterings). 1796. Hillier, The Art of the Japanese Book, Vol. I, plate 71. Fine impression. Very good colour and condition with a centrefold as always. Top right and left corners restored. 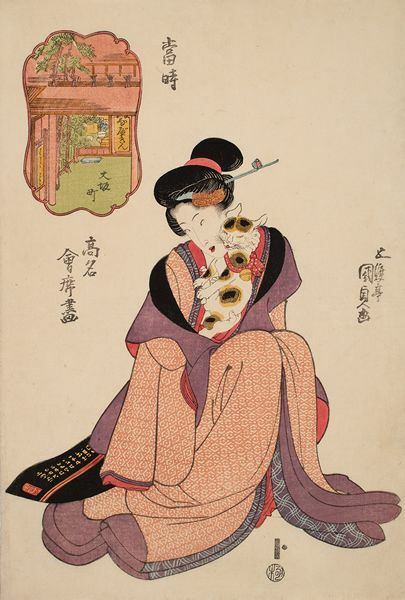 Keisai Eisen (1790-1848)- A Beauty with a Cat. Circa 1830. Vertical oban diptych. Very good impression, colour and condition. Beauties. 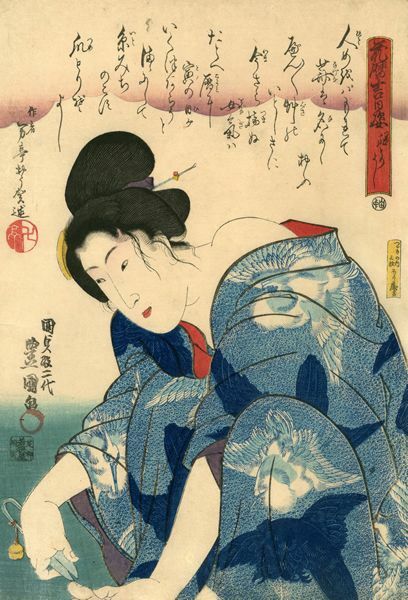 Utagawa Kunisada (1786-1864)- A Woman Cutting Her Toenails. From the series Hanagoyomi kuchinichi sugata (Lucky Days from the Almanac). 1844. Oban. Fine impression and colour. Very good condition. 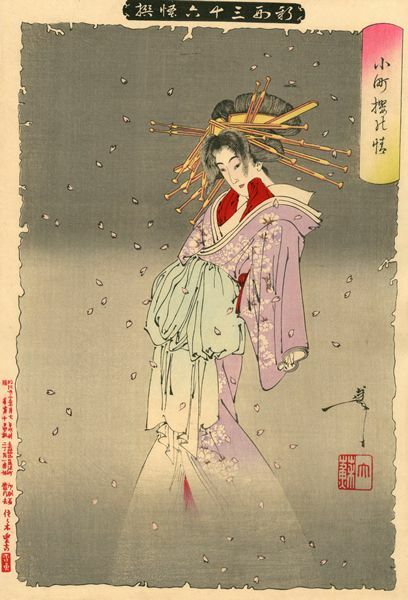 Utagawa Kunisada (1786-1864)- Snow at Mimeguri (Mimeguri no Yuki). From the series Shiki no uchi(Four Seasons). Circa 1830’s. Oban triptych. 38.7 x 78.6 cm. Oka Isaburo and Suzuki Juzo, Koki Ukiyo-e , Vol. 7, plate 25 (this impression). Fine impression, colour and condition. Utagawa Kunisada (1786-1864)- A Woman Playing with a Cat. Yometori yoshi (An Auspicious Day forBrides). From the series Hanagoyomi kichimichi sugata (Images FromAuspicious Days in the Floral Calendar). 1844. Oban. 37 x 25 cm. Fine impression, colour and condition. 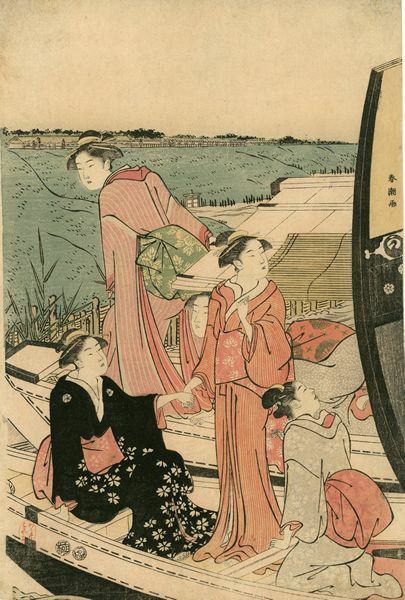 Katsukawa Shuncho (Active late 1770s-late 1790s)- Beauties in Pleasure Boat at the Mukojima Landing. Early 1790. Oban. Very good impression, colour and condition. Provenance: Wakai. The middle sheet of a triptych. The same sheet is in Honolulu (ex Michener Collection) and the entire triptych is in Boston (ex Spaulding Collection). Toyohara Kunichika (1835-1900)- Evening View of Beauties at Nihonbashi (Nihonbashi bijin no yukei). 1863. Oban triptych. 37.8 x 77.9 cm. Kunichika yakusha kagami (Riccar Art Museum, 1981), no. 24. Fine impression, colour and condition. 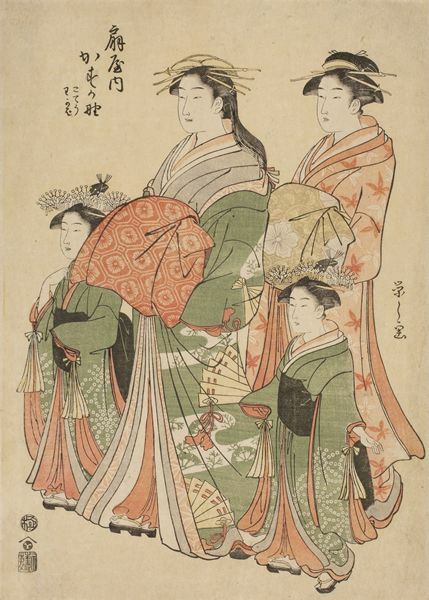 This triptych shows three types of women; a geisha, a city girl, and a married woman. 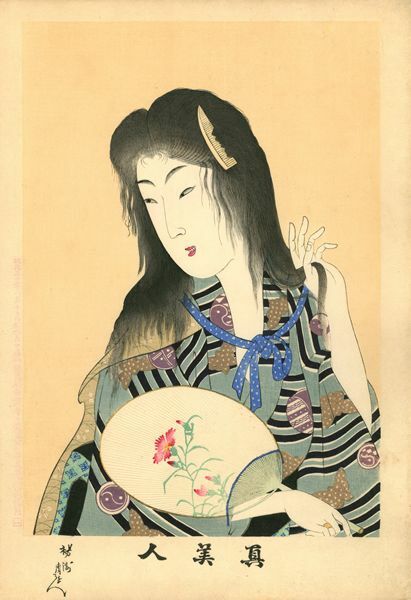 Tsukioka Yoshitoshi (1839-1892)- Looking Delighted: the Appearance of a Present-day Geisha of the MeijiEra (Ureshi-so: Meiji nenkan tokon geigi no fuzoku). From the seriesFuzoku sanjuni-so (Thirty-two Aspects of Customs and Manners). 1888. Oban. 37.3 x 25.5 cm. Keyes 503-32, Stevenson 31. Fine impression, colour and condition. 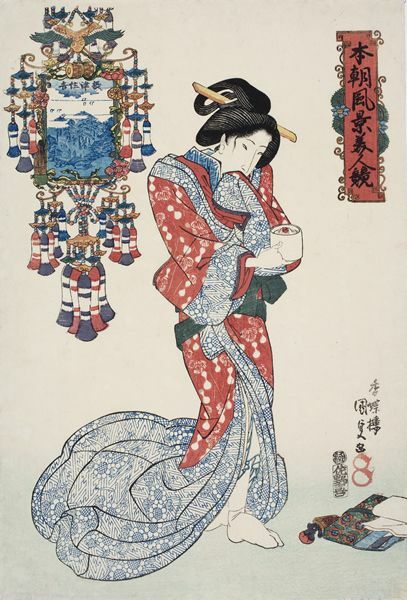 Tsukioka Yoshitoshi (1839-1892)- Looking Chilly: the Appearance of a Concubine of the Bunka era. From the series Fuzoku sanjuniso (Thirty-two Aspects of Customs and Manners). 1888. Oban. Keyes 503-13, Stevenson 7. Fine impression and colour. Fine condition with unusually large margins. 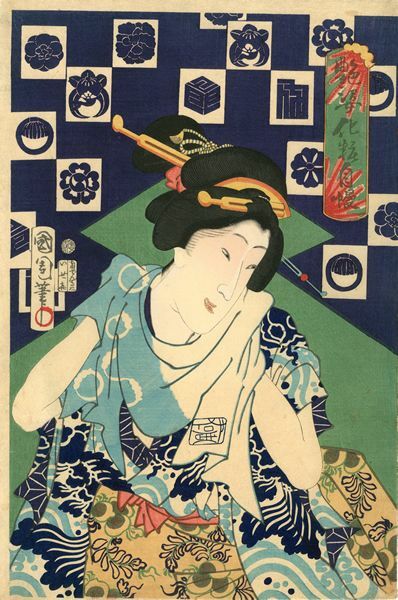 Utagawa Kunisada (1786-1864)- Three Women in an Interior. From the series Tatsumi hakkei no uchi (Eight Views of Fukagawa). Early 1840. Oban triptych. Fine impression, colour and condition. 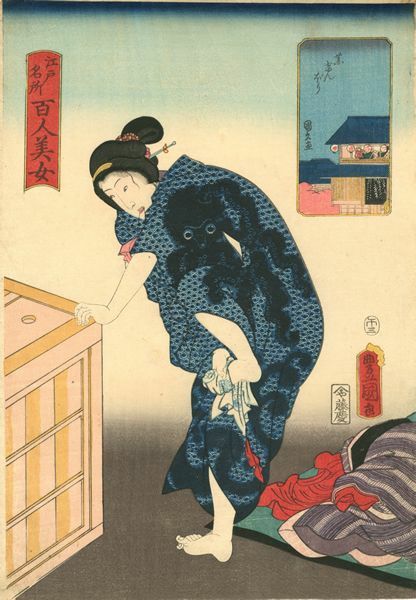 Utagawa Kunisada (1786-1864)- A Woman Holding a Cat. Nabekin of Osakamachi. 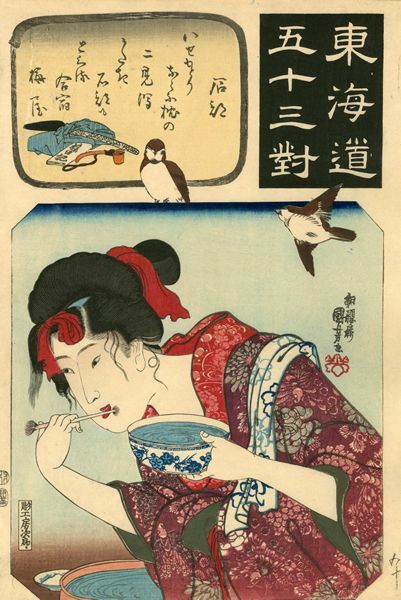 From the series Tojikomei kaiseki zukushi (A Collection of Famous Restaurants of ModernTimes). Circa 1820. Oban. 38.1 x 25.6 cm. UTS/11/283. Fine impression, colour and condition. 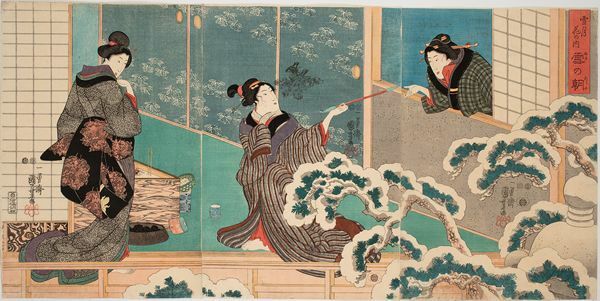 Utagawa Kuniyoshi (1797-1861)- A Snowy Morning (Yukinoasa). From the series Setsugekka no uchi(Snow, Moon and Flowers). Circa 1850. Oban triptych. 37.5 x 76.3 cm. Baur/II/G-405. Fine impression, colour and condition. 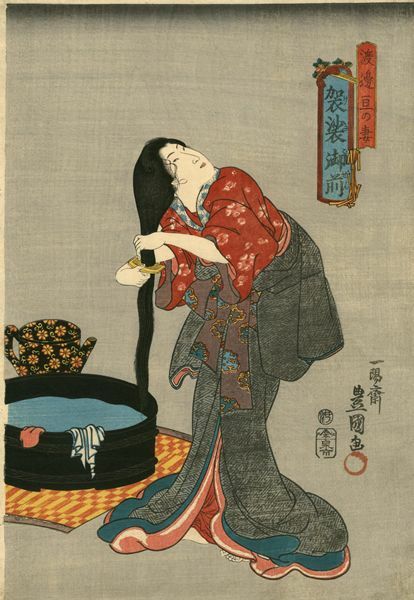 Utagawa Kuniyoshi (1797-1861)- Whetstone Suggesting the Tonsure. 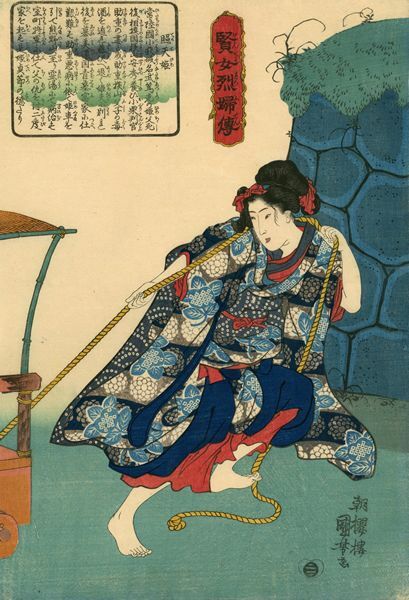 From the series Shimazoroi onnaBenkei (Women in Benkei-checked Fabrics). Circa 1844. 1844. Oban. 37 x 25.3cm. Robinson (1961) no. 137. Fine impression, colour and condition. 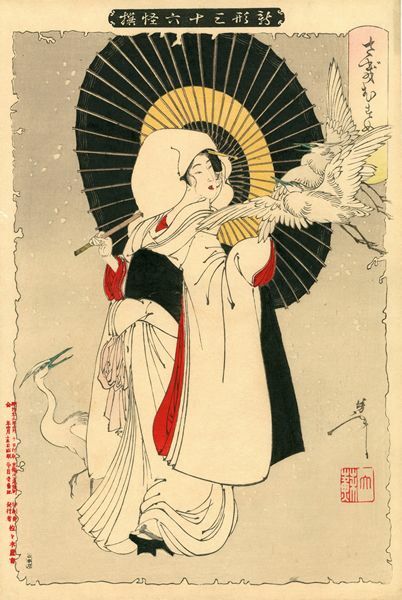 Tsukioka Yoshitoshi (1839-1892)- Heron Maiden. From the series Shingata sanjurokkaisen (New Forms of Thirty-six Ghosts). 1889. Oban. Keyes 509-2. Stevenson 2. Fine impression with two colour cartouche. Fine colour and condition. 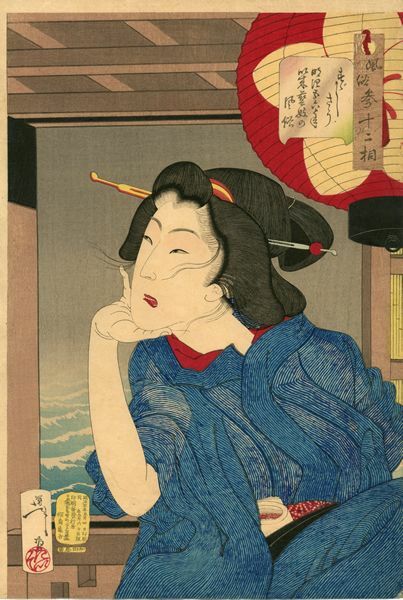 Toyohara Kunichika (1835-1900)- A Half-Length Portrait of a Beauty. From the series Adesugata kesho jiman (Pride of Beauties Applying Cosmetics). 1866. Oban. Fine impression, colour and condition. Unusually, an extra block for the face is printed in gofun. 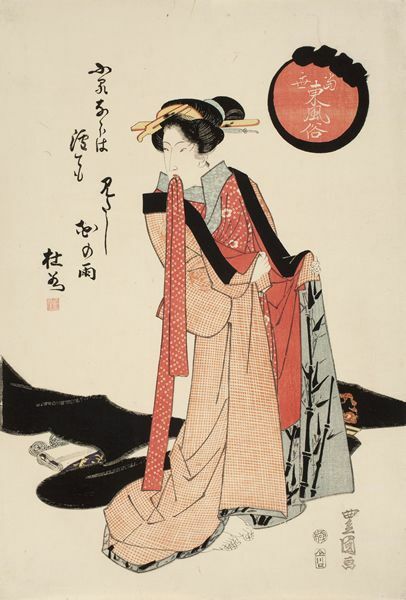 Keisai Eisen (1790-1848)- A Woman Holding Her Kimono in the Wind. 1830. Vertical oban diptych. 74.2 x 25. Fine impression, colour and condition. 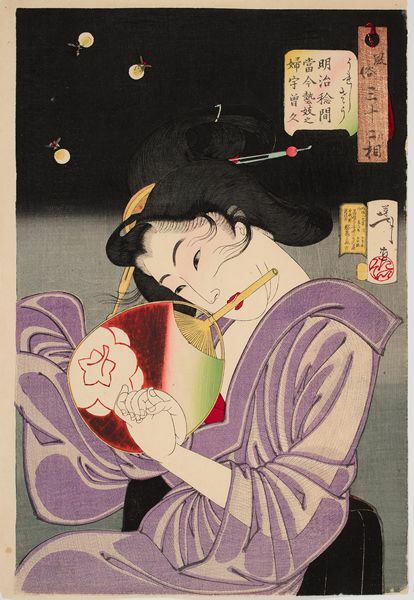 Kikugawa Eizan (1787-1867)- A Woman Lighting a Lantern. Circa 1830. Vertical oban diptych. 74.2 x 37.1 cm. Fine impression on luxurious paper. Very good colour and condition with a few expertly restored wormholes. 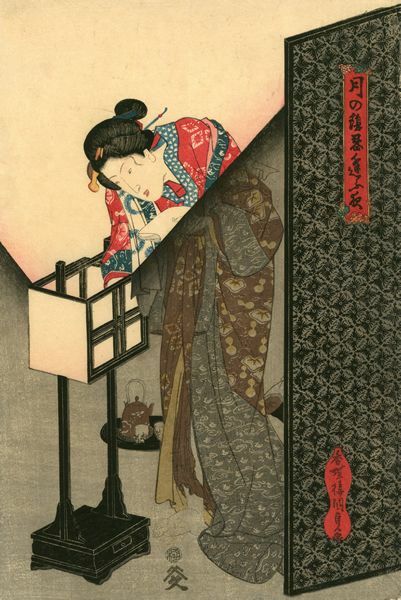 Utagawa Kunisada (1786-1864)- A Beauty Putting Out a Floor Lamp. 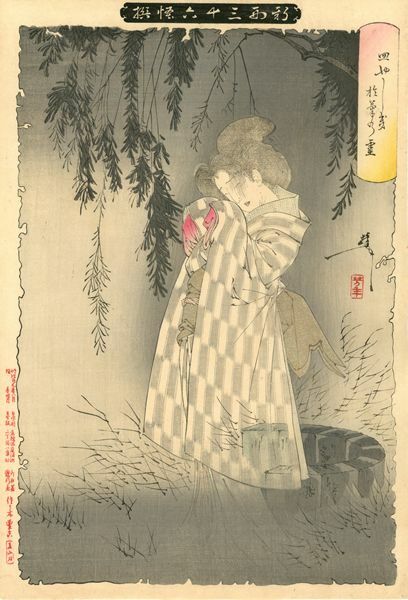 From the series Tsuki no kage shinobiau yo (Secret Meetings by Moonlight). Circa 1836-8. Oban. 38.9 x 26.1cm. Kunisada's World 73/1 (this impression). Fine impression, colour and condition. 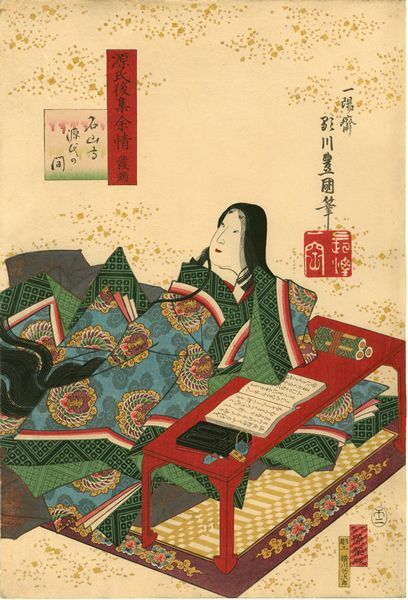 Utagawa Kunisada (1786-1864)- Lady Murasaki at Her Writing Table. Hattan: Ishiyamadera Genji no ma (Frontispiece: The Genji Room at Ishiyama Temple) . From the series Genji goshu yojo. (Lasting Impressions of a Late Genji Collection). 1858. Oban. Fine, early impression. Brilliant colour. Fine condition. Genji World in Japanese Woodblock Prints, no. 104. 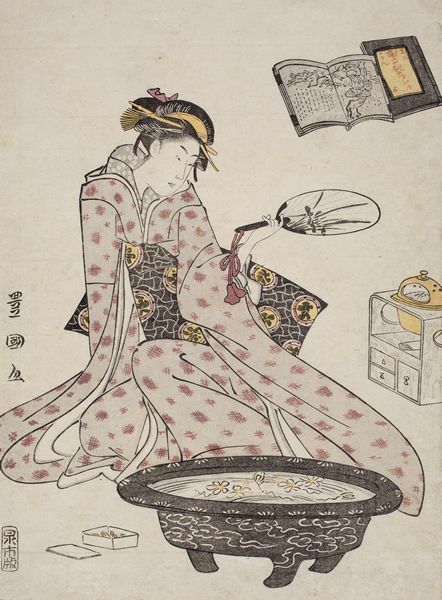 Utagawa Toyokuni (1769-1825)- A Woman Seated with a Fan. Shinpan Hanasaki Jijii jo (New edition of the Old Man Who Made Flowers Bloom, Part I). Circa 1795. Chuban. 25.4 x 18.8cm. Two other impressions are recorded - one in Boston (ex Spaulding) and the other ex Stociet (Sothebys, London, 2004, lot 331). Utagawa Kunisada (1786-1864)- Prince Genji Admiring Beautiful Women. 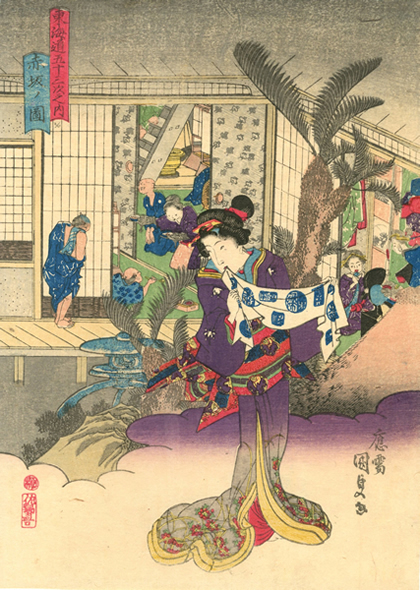 Edo Murasaki Sugata no utsusemi (Figures in Edo Purple, the Utsusemi Chapter). Circa 1850. Oban triptych. Fine impression, colour and condition. 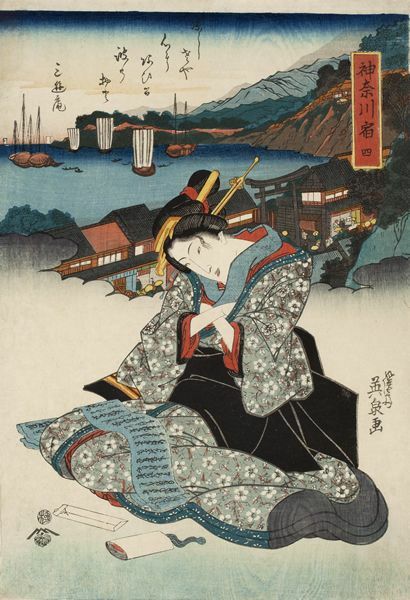 Utagawa Kunisada (1786-1864)- Chapter 13 (Jusan no maki). From the series Lasting Impressions of a Late Genji Collection (Genji joshu yojo). 1858. Oban diptych. Fine impression with the embossed Genji mon printed in the background. Fine colour and condition. Genji’s World in Japanese Woodblock Prints, no. 116. From the series Tosei asuma fuzoku (Modern Fashions From the East). Circa 1818. Oban. 39.2 x 26.5cm. Fine impression, colour and condition. A similar print by Toyokuni dated to the late Bunka period, from the series Tosei kotoba no hana, is illustrated in Bunka-Bunsei bijin fuzoku ukiyo-e shu (plate 6). Circa 1793. Aiban. 31.6 x 22.4cm. Fine impression, colour and condition. What appears to be another print from this untitled series is illustrated in Brandt, 169, no. 133. Circa 1830. Vertical oban diptych. 72.5 x 24.6cm. Fine impression. Very good colour and condition. (Kanagawa shuku). 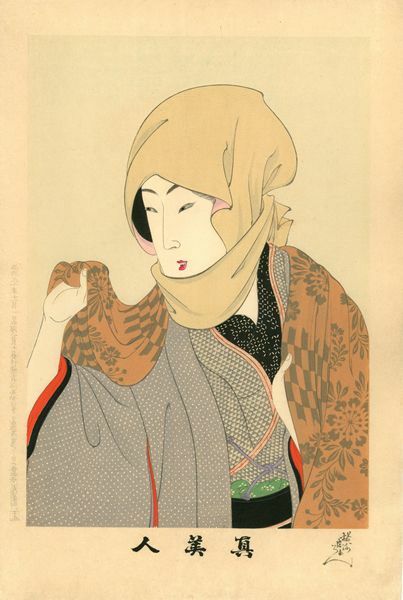 From the series "commonly known" as Bijin Tokaido (Beauties on the Stations of Tokaido Road). Circa 1842. Oban. 37.4x25.5cm. Fine impression with strong woodgrain. Fine colour. Very good condition. From the series Adesugata kesho jiman (Pride of Beauties Applying Cosmetics). 1866. Oban. 37.2 x 25.1cm. Fine impression, colour and condition. An extra block is unusually printed in gofun for the application of make-up on the woman's neck. 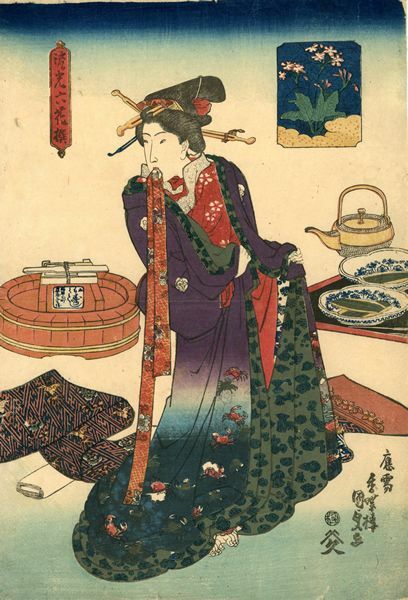 Utagawa Kunisada (1786-1864)- A Beauty Holding a Porcelain Incense Burner (Sumiyoshi Settsu (Sumiyoshi Shrine in Settsu Province)). 1832-34. From the series Honcho fukei bijinkurabe (A ompetition of Beauties and Celebrated Views of Japan). Oban. 38.9 x 26.6 cm. 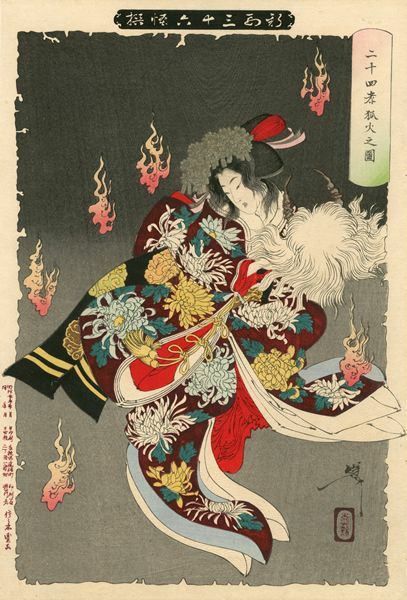 Izzard, Kunisada’s World, 64-1. Fine impression, colour and condition. 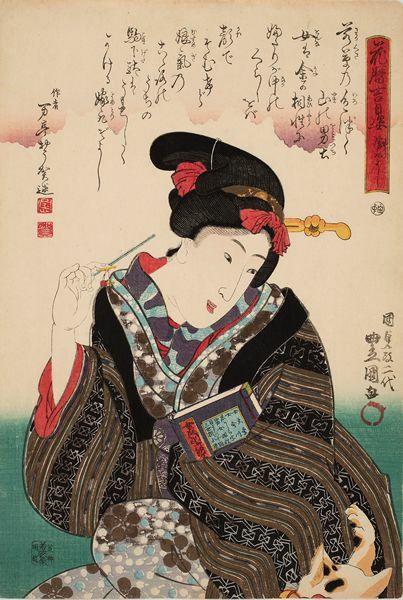 Utagawa Kunisada (1786-1864)- Akasaka. From the series Tokaido gojusan tsugi no uchi (The Fifty-three Stations of the Tokaido Road). Ca. 1838-42. Chuban. Fine impression, colour and condition. Kawanabe Kyosai (1831-1889)- Three Beauties at Hirakawa Ryotei. Edo meisho: Tsukiji Namiyoke (Views of Edo: Night View of Namiyoke Inari Shrine in Tsukiji). 1864. Oban triptych. Very good impression, colour and condition. Ca. 1840. Oban. Fine impression and colour. Printer crease. Very good condition. 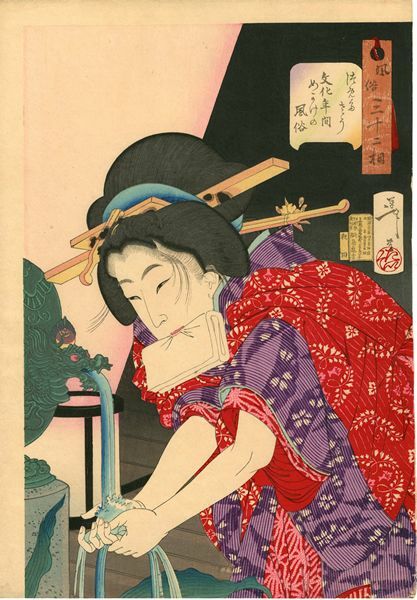 Utagawa Kunisada (1786-1864)- A Woman Preparing to Sharpen a Blade. Yondan-me (Act Four). From the series E-kyodai Chushingura (Brother Pictures From Chushingura). Ca. 1830s. Oban 39.3 x 26.4 cm. Fine impression, colour and condition. 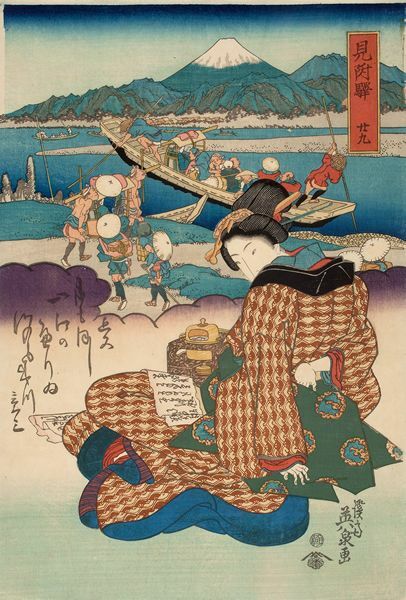 Ichiyusai Kuniyoshi (1797-1861)- Prince Genji with Attendants by the Sea. Ca. 1850. Oban triptych. Fine impression, colour and condition. 1849-1851. Oban triptych. Marks, Genji World in Japanese Woodblock Prints, no. 10, page 77. Fine impression, colour and condition. 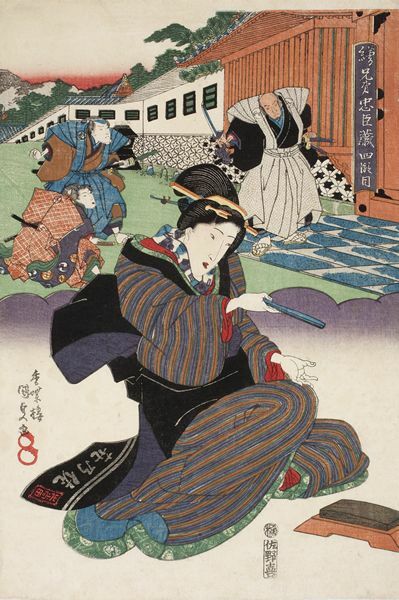 Utagawa Kunisada (1786-1864)- Yagenbori from the series Edo meisho hyakunin bijo (One Hundred Famous Places and Beauties of Edo). 1858. Oban. Fine impression, colour and condition. 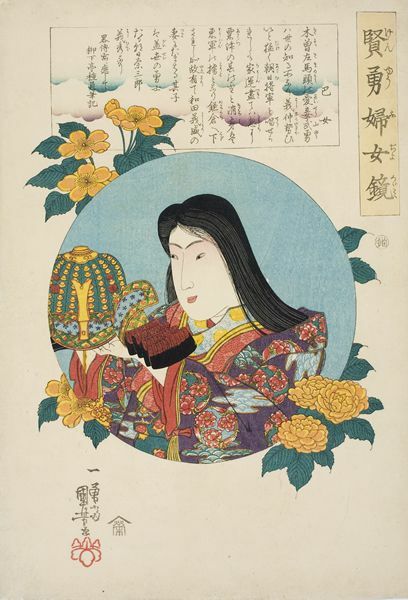 Ichiyusai Kuniyoshi (1797-1861)- Tomoe-gozen, the Mistress of Kiso Yoshinaka, Holding a Helmet. Ca. 1843. From the series Kenyu fujo kagami (Mirror of Women of Wisdom and Courage). Oban. 37.6 x 25.6 cm. Provenance: S. Tuke; B. W. Robinson. Fine, early impression with strong woodgrain. Brilliant colour. Fine condition. 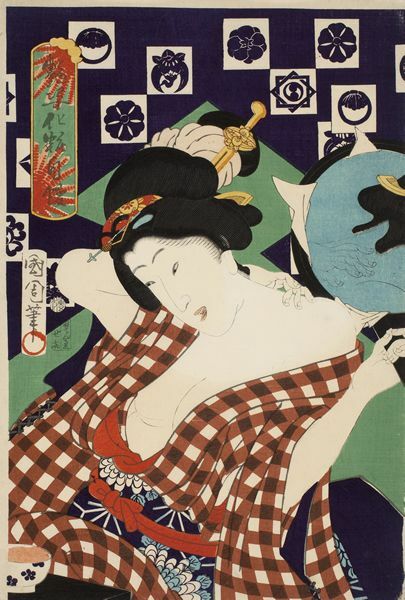 Though this print comes from Robinson’s own collection, it is not recorded with the other prints from this series in his 1982 monograph on Kuniyoshi’s warrior prints. Nor was it included in the privately published supplement distributed by Professor Arthur Miller in 1996. Sweets from Fukagawa (Fukagawa no kashi). From the series Tosei teikin orai (Contemporary Models for Correspondence). Circa 1830. Oban. 38.7 x 26.6cm. Fine impression and colour. Very good condition. 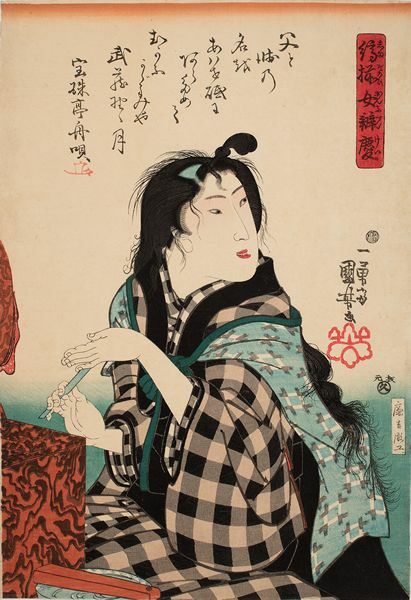 Tsukioka Yoshitoshi (1839-1892)- Looking Cool: The Appearance of a Geisha in the Fifth or Sixth Year of Meji (Suzushiso: Meiji go-roku nen irai geiga no fuzoku). From the series Fuzoku sanjuniso. (Thirty-two Aspects of Customs and Manners). 1888. Oban. 37.4 x 25.4cm. Keyes 503-20, Stevenson 24, Keyes, The Bizarre Imagery of Yoshitoshi, no.40. Fine impression, colour and condition. 1840s. Oban. Fine impression with wood grain. Fine colour and condition. Circa 1842. Oban. 38 x 25.8cm. Fine impression, colour and condition. Circa 1842. Oban. 37.4 x 25.4cm. Fine impression, colour and condition. Early 1840. Oban. Robinson S20-22. Fine impression, colour and condition. Circa 1845-6. Oban. Robinson S44-53. Fine impression and colour. Narrow bottom margin, otherwise fine condition. 1897. Oban. Fine, early impression with blind printing in the fan. Fine colour and condition. Toyohara Chikanobu (1838 - 1912)- A Fashionable Meiji Beauty. From the series Shin bijin (True Beauties). 1897. Fine, early impression. Fine colour and condition. 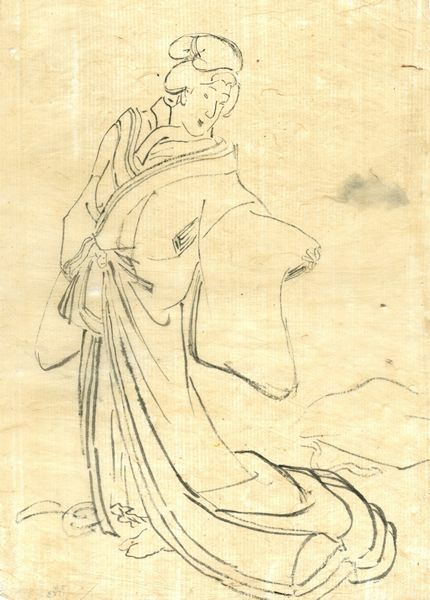 Original drawing in sumi-e. Very good condition.